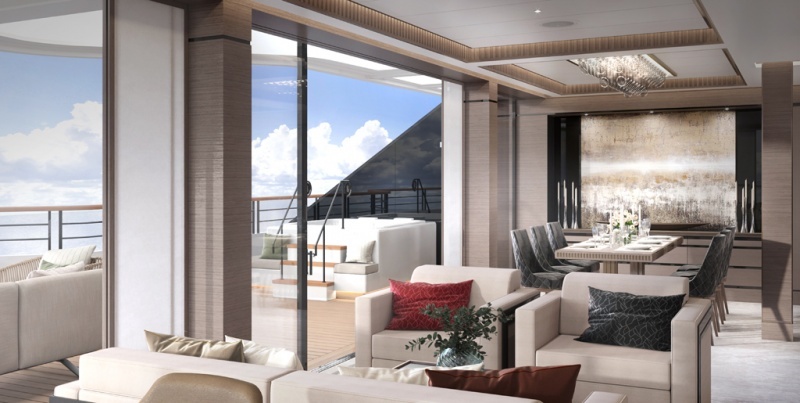 The Ritz-Carlton Yacht Collection has revealed more enticing details of Azora, her accommodation, and amenities ahead of its February 2020 launch. Azora has a capacity of 298 guests and has been created to feel like a private yacht. The yacht will uniquely feature one designer, resulting in a unified flow of design which is refined, relaxed and unlike any other accommodation at sea. The Owners Suite is the pinnacle suite of Azora, the suite has a luxurious and modern living and dining area and large private terrace overlooking the ocean with its own private whirlpool. The interior design of the Azora was imagined by Tillberg Design of Sweden in collaboration with The Ritz-Carlton. The ship will also feature several loft suites, these suites offer unique two-story accommodation making it ideal for in-suite entertaining. All suites will feature a private terrace, floor to ceiling windows and high ceilings, resulting in some of the airiest and expansive suites in the luxury cruise category, the company said in a statement. Through a soundproof, blind wall, select suites also have the option to be combined into larger, open-concept spaces allowing more flexibility when selecting accommodations. All suites feature the luxurious amenities that visitors would find in a Ritz-Carlton on land. Each suite onboard Azora will have access to a Personal Concierge, who will be able to make dinner reservations at the onboard specialty dining venues and to organise your destination experiences on one of their immersive Shore Collection excursions. Each voyage onboard Azora will be an all-inclusive luxury experience including all onboard activities and entertainment, beverages, multiple dining venues, onboard gratuities, Wi-Fi and watersports from the yacht’s marina. Signature experiences are available onboard for an additional fee include a culinary experience at the yacht’s specialty restaurant designed by three Michelin-starred Chef Sven Elverfeld of The Ritz-Carlton, Wolfsburg, spa treatments at the signature Ritz-Carlton Spa and immersive excursions offered through The Shore Collection. For more information on this stunning ship please visit our website www.sovereigncruise.co.uk or for a personalised quotation please call one of our luxury cruise experts on 03331 224466.